George Graham was a surgeon in Brampton. During his working life he encountered both the poor and the non-poor. His name appears on voucher PR60/21/13/5 which relates predominantly to child deliveries with fees ranging from 15s to £1.5s. As one item on the bill relates to the Workhouse it is assumed that the mothers were poor. The mothers are referred to by the prefix ‘Miss’ and a surname. One is simply referred to as ‘a pauper in Brampton’. Excepting a Miss Robb or Ross and the pauper however, it is possible to determine who some of those concerned are. Four have been identified: Robert, illegitimate son of Margaret Dobson 11 March 1814, Forrest Head. Ann, illegitimate daughter of Ann Atkinson, spinster, 5 May 1815, Brampton; George, illegitimate son of Sarah Taylor, weaver, 5 November 1815 Brampton; and Margaret, illegitimate daughter of Margaret Wallace, 12 January 1816, Brampton. From parish registers, four have been identified: Robert, illegitimate son of Margaret Dobson, 11 March 1814, Forrest Head; Ann, illegitimate daughter of Ann Atkinson, spinster, 5 May 1815, Brampton; George, illegitimate son of Sarah Taylor, weaver, 5 November 1815, Brampton; and Margaret, illegitimate daughter of Margaret Wallace, 12 January 1816, Brampton. Other vouchers bearing Dr Graham’s name are for medication but it is not clear who they are for. Medicines include, Cream Tartar 4d, Cordial Mixture 3s, Diuretic Mixture 3s, Bronchial Mixture 3s, Opening Powder 6d, and Tonic Powders 5s. Although the precise ingredients are not stipulated, Dr T J Graham’s Modern Domestic Medicine (1837) may give some idea as to the ingredients used. Dr Graham was born at Bankhead, Canonbie, Dumfriesshire on 15 October 1783 in the Esk Basin. This was once known as the ‘Debatable Land’ between England and Scotland where the Graham, Armstrong, Bell and Elliot families administered the law. George Graham had five siblings: three sisters Sarah (1777-1862), Janet (1778-1841) Margaret or Peggy (1786-1836), and brothers William (1781- 1849) and John (1789- 1838). Sarah married farmer Richard Johnstone (1773-1873) and Janet also married a farmer, John Hope (1779 -1866). George’s parents Peter Graham (1740-1825) and Ann Nichol (1747-1831) left the farm at Bankhead around 1790 and moved the short distance to Cubbyhill near Longtown. George became a Surgeon, John became a silk mercer in London, and William took over the farm. Dr Graham began practice in Brampton in 1811. His name can be found in the 1829 trade directory at Market Place. He was one of three surgeons in Brampton; the others being T. Gilbanks, H. Dobson and W. Fleming. In 1834 he was joined by an assistant William Armstrong (1812-1886), also born in Canonbie. Dr Graham purchased a property in Market Place in the centre of Brampton for £400 in 1836 and began a Doctors’ Partnership with Dr Armstrong in 1839. They can be both found on the 1841 Census at Front Street, Brampton. They were joined in the practice by John Graham(1820-1893) George Graham’s nephew, one of his brother William’s 12 children. John Graham continued in the practice till 1861 when he sold up to leave for London along with his wife. William Armstrong continued to be involved in Brampton affairs, becoming Justice of the Peace for Cumberland and Chairman of the Brampton Poor Relief Fund in 1878. He died at Garden Terrace, Brampton, 5 August 1886. Some of Dr Graham’s work involved the administration of justice. Local newspapers give an insight into what is hoped were the less common events in his working life. 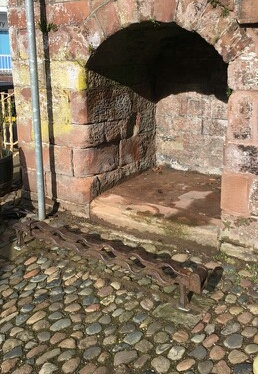 In 1836 he ordered the release of a Jwhonnie Steeson (sic) from his punishment in the stocks Market Place, Brampton. The event was recalled by local poet Peter Burn (1831- 1902). In 1841 at the trial of Jane Hogg and her mother Mary Hogg for the murder of Jane’s newborn child, Dr Graham gave evidence. Jane and Mary Hogg were both found guilty but the death sentence was commuted. The Jury asked for leniency for Jane. Lord Chief Justice Denman said of her mother Mary ‘if I were perfectly convinced that she had destroyed the child for the purpose of saving the expense of keeping it … I should have no choice but to leave her to the executioner’. He felt that all the facts were not known. Jane was given a life sentence, Mary was transported on 2 May 1842 to Van Diemen’s Land never to return. All three doctors were together two years before Dr George Graham’s death at the celebration of the Earl of Carlisle’s birthday at the Howard Arms, Brampton. octor Graham’s death is reported in the Carlisle Patriot, 2 July 1847: ‘At Brampton on the 26th ult George Graham Esq surgeon aged 63 much respected by a wide circle of acquaintances‘. He was buried at Lanercost, two miles from Brampton. Thomas J. Graham, Modern Domestic Medicine. A popular treatise illustrating the symptoms, causes and distinction and correct treatment of the diseases incident to the human frame; embracing the modern improvement in medicine (7th edn., 1837), https;// books.google.co.uk, accessed 14 Mar. 2019.
 www.scotlandspeople.gov.uk, accessed 14 Mar. 2019. Dumfries and Galloway Family History Society, Canonbie Parish Church Monumental Inscriptions (2006). W. Parson and W. White. Directory and Gazetteer Cumberland and Westmorland (1829). www. convictrecords.com.au, accessed 14 Mar. 2019. Vouchers from Hayton Parish PR102/114/9-11 concern the purchase of textiles from Peter Dixon & Sons, Warwick Bridge. The materials purchased included blue flannel, check, grey and black calico. Who the material was for is unstated, however, being of a darker cotton material, it was probably destined for the poor. Their clothes needed to be cheap, hard wearing and slow to show the dirt. 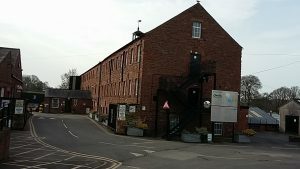 The mill at Warwick Bridge was called Longthwaite Cotton Mill built in 1790 and run initially by brothers John, Richard and George Ferguson. John died in 1802 and in 1809 Richard and George, offered the mill’s lease to their brother-in-law Peter Dixon (1753-1832). Peter, a merchant from Whitehaven, had married their sister Mary Ferguson (1762-1814) in 1783. Dixon took on the lease with his sons John (1785-1857), Peter (1789-1866) and George (1794-1860). Dixon’s other children were Richard (b.1788) , Ann (b.1792), Robert (b.1793) Joseph F. (b.1795), Frances (b.1797) Mary (b.1798) and Sarah (b.1800). The brothers Peter and John bought extra land in order to enlarge the mill and improve its access to a good water supply. They built new cottages and provided employment for those living in the local area as well as a few residing in the poorhouse. Women and children employed in the mill were paid 3s to 10s depending on their age. Peter Dixon died in 1832 and the sons sought to expand the business further as the textile industry expanded overall. Peter Dixon jun. was the most influential in the running of the mill. In 1834 the Dixons bought land in Duke Street, Carlisle. They also bought nearby shops and houses to let to their workers. The cotton mill in Shaddongate and the accompanying chimney were completed on 25 October 1836. At the time the chimney was the highest in the country. The mill was powered by steam rather than water. Production continued at Warwick Bridge, although the Dixons did try to sell the mill, without success staying and building further workers cottages and a school. The Dixons built and lived in substantial residences themselves. Peter and his wife Sarah Rebecca Clark lived at Holme Eden Hall, Warwick Bridge, built around 1840; John and his wife Mary T Stordy at The Knells near Houghton built in 1826 . George and his wife Mary Boucher lived at Tullie House, Carlisle, his father Peter having bought it in 1825. The Dixons were influential in the politics of Carlisle , Peter and George serving terms as Mayor. By 1847 they had a further 2 mills at Cummersdale and Dalston along with the mills at Warwick Bridge and Shaddongate. In total, the Dixons employed about 8000 people. Peter Dixon died 28 April 1866 and was buried in the grounds of Holme Eden Church. The Carlisle Journal reported that many villages came to the church to pay their respects not only to someone who had spent a long life amongst them but who had also shown them true acts of benevolence. By 1872 the cotton industry was less profitable. Proceedings were begun for the liquidation of Peter Dixon & Sons. Peter Dixon’s estate was sold, including Holme Eden Hall and the workers’ cottages at Burnrigg near Warwick Bridge. Cotton production ceased at Warwick Bridge but the Dixon’s continued for a short while as a new limited company involved in the completion process of the textiles from the Shaddongate factory. Most of the mills and buildings the Dixons built still exist today being adapted for differing purposes. The largest of which, Dixon’s chimney, is still a well known local landmark with a small tweed mill nearby. Ferguson Brothers opened a Mill at Holme Head, Carlisle in 1824. That building also survives. Thomas Gill lived in Lamonby and Leath in Skelton parish. He was described as a labourer in the parish according to the records available. It is assumed that he took on labouring work most of his life and that his income and ability to make a living would be very dependent on his ability to work. Skelton being a rural area the work would most likely involve that related to agriculture. He married Elizabeth (Betty) Gibson when he was 37 and she was 21 on 23 November 1774. 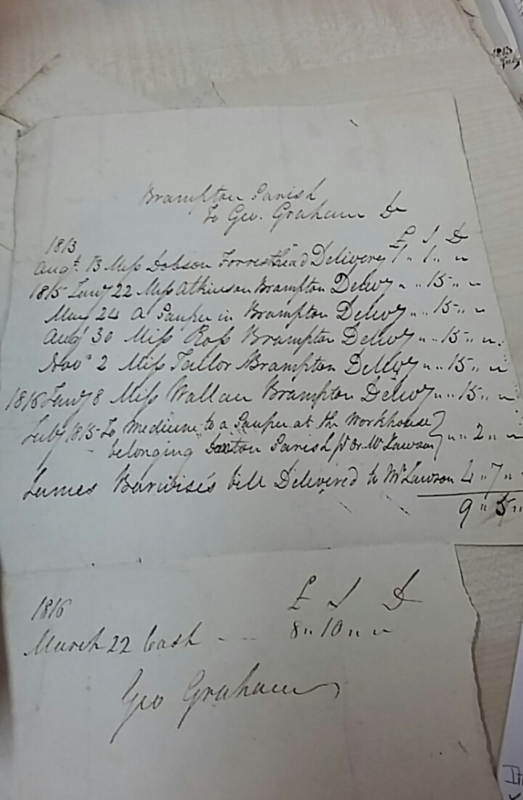 It is possible that Gill had been married before as Skelton poor law vouchers show that the parish overseer arranged a binding into an apprenticeship for a Thomas Gill’s son in 1772. Whether this was this Thomas Gill’s son is not known. Thomas and Elizabeth had 5 children William (b.1775) , Hannah (b.1776), Mary (b.1779), Margaret (b.1781) and Elizabeth (b.1786.) When Elizabeth was born Gill was referred to as a pauper. By the 10 March 1789 Gill had died aged 49; his family were presumably left to struggle on. His son William had already died in 1775 aged 2 months. Hannah, his daughter, was alive in 1799 and had a son, Thomas. His birth is recorded as illegitimate on 23 May of that year. If his wife Elizabeth remarried or how long she lived is unknown. Assuming the family were unable to pay for his funeral, Skelton parish appears to have borne the cost. The parish provided similar provisions for the pauper funeral of Edward Tinkler in 1793 as well as others. 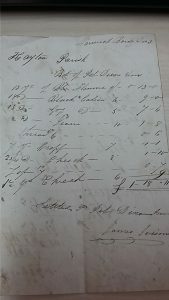 With similar items on the small bills and petty cash vouchers, the expense for Gill’s funeral included bread from Wm Nicholson, £0.4s.0d, Ale and Beer from Ann Todd £0.2s.0d, butter from Wm Hodgson £1.6s.0d, cheese £0.2s.0d, sugar £0.1s.6d, barley 2 quarters £0.0s.5d, cakespice £0.0s.2d, tobacco 2 0z £0.0s.3d, candles £0.0s.4d, a shroud £0.2s.6d, 10oz tea, a coffin £0.12s.0, and Church fees £0.1s.6d; the total cost being £1.8s.5d. Who consumed the food is not known. This may not be comparable with a pauper’s funeral in the larger cities. The respect afforded the poor in death may have been dependent on parish finance and those who administered them. In rural areas the fear of resurrectionists and anatomists was probably less than in the larger cities with medical schools. These schools could procure bodies for research in unethical ways. The Anatomy Act of 1832 proposed to address this by allowing poorhouses, workhouses and hospitals to give up bodies not claimed by friends of relatives to surgeons and teachers of anatomy. Some argued that this would benefit the poor by reducing the cost of medical advice while also helping medical science. The likelihood is it perpetuated the poor’s fear of the workhouse. The following is taken from Cumberland and Westmorland Antiquarian and Archaeological Society iv, 425-435, Rev R.W. Dixon, ‘Hayton: The Old Registers’. Before poor law unions the poorhouse Hayton was at Street House. It is to this the agreement between Thomas Wharton of Faugh and the churchwardens refers to. Thomas Wharton had an agreement with Hayton Parish for a year in 1773 for ‘letting of the poor’ for a year. The Parish provided clothing and apparel. Wharton was to mend their clothes and stockings. £5 being appointed for the purpose. Under 1 year olds to be counted with their mother as one person. He was to provide meat, drink, washing and lodgings for the paupers. He was given a weekly allowance of £0.1s. 2d for each pauper adjusted if they left before the week was out. A yearly salary of £12.10s was given to him. If the pauper died in the house he was to be buried at the expense of the parish. What this provision entailed can only be surmised. This practice may have continued with an arrangement with Thomas Milbourn of Towtop in 1776 for letting of the poor for one year. This is a work in progress subject to change. The following come from the Universal British Directory. The following is an edited version of the entry in the fifth volume of the Universal British Directory. Wigton is in the forest of Allendale, 306 miles from London. Here is an hospital for six poor clergymen’s widows, and a free grammar school. Its market is on Tuesdays; fair, 25 March. On the approach to this place, a fine view opens to the northward: a rich vale, bounded by the Scotch hills, over which Scarfell frowns with that pre-eminence that Skiddaw assumes over the neighbouring mountains to the right. About a mile from Wigton is that ancient Roman station Caer Leol, situate on an easy ascent, and commanding an extensive prospect towards Solway Firth and the Scotch borders. The remains here are very extensive, foundations of innumerable buildings being scattered over many acres. Near Wigton is Burgh-upon-Sands. It lies on the north side of the river Wathimpool, which towards the north-west is washed by the sea flowing up into the foot of the river Eden. Brampton is an ancient but small market town, containing about fifteen hundred inhabitants. It was formerly a Roman station. Brampton is still the capital of the Barony of Gillsland, belonging to the Earl of Carlisle; and the baron courts are held here twice a year. Its site is low and uneven; the soil is sandy. The town is rather irregularly built. It is a thoroughfare to Newcastle from Carlisle, Whitehaven, &c. It has two great fairs, at which many thousand (sic) of sheep and black cattle are sold; the fair days are the second Wednesday after Whitsuntide, and the second Wednesday in September. Here are two market days, Tuesday and Saturday; the former is by far the most considerable, the latter only for the town. Messrs. Fleming and Temporly carry on very considerable check manufactory in this place. Messrs. Ramshay, Gray and Co., have a large commodious brewery; and do a good deal of business. There is also an hospital for six poor men and six poor women. There are two carriers, Thomas Bell and Thomas Mason, who set out with carts every Tuesday evening for Newcastle, and return on the Thursday night following; they go for Carlisle on Monday morning, and return in the evening. A diligence passes between Newcastle and Carlisle through Brampton twice a week carrying passengers, newspapers and parcels. Immediately on the N. E. of Brampton is a high hill called the Mote, the summit of which is cast up, and appears to have been a beacon to alarm the country in times of danger. Before the union of England and Scotland, these beacons were extremely useful. On the north of Brampton, about a mile distant, runs the famous Roman wall. About two miles north-east of Brampton, in a low situation, and surrounded with wood, stands Naworth Castle, the seat of Lord Carlisle. It is a fine Gothic structure, of considerable antiquity. Some reparations have lately taken place, planned with great taste and judgement. Nine miles from Brampton is Gillsland Wells, much frequented by people of fashion, both from north and south of the Tweed. Whitehaven is a seaport and market town, distant from London three hundred and fourteen miles, one hundred and thirty four from Manchester, seventy nine from Lancaster, fifty seven from Kendal, twenty seven from Keswick, thirteen and three quarters from Cockermouth, and seven from Workington. The town is situated between two hills, and the harbour lies in a bite from the sea, and the tide formerly used to flow where the town now stands. A storm did great damage to this place in March 1793, when the tide rose six feet above its usual height. In the American war Paul Jones landed here and spiked up the guns, and set fire to two ships in the docks; but by the vigilance of the inhabitants, there was but little damage done, and he was forced to retreat. Whitehaven has grown up by the encouragement of the Lowther family, from a small place, to be very considerable by the coal trade, which is so much increased of late, that it is the most eminent port in England for it next to Newcastle; for the city of Dublin, and all towns of Ireland on that coast, and some parts of Scotland, and the Isle of Man, are principally supplied from hence. It is frequent in time of war, or upon occasion of cross winds, to have two hundred sail of ships at a time go from this place to Dublin laden with coals. 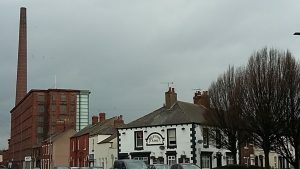 It is a large, rectangular, well-built town, about one third bigger than the city of Carlisle, but containing three times the number of inhabitants. These inhabitants are all perfectly well lodged, all embarked in profitable employments, of one kind or another; so that they are in a continual scene of unaffected industry, and carry on their affairs with great dispatch, and yet without hurry or confusion. They have a plentiful and commodious market, supplied by and supplying both necessaries and conveniences to a very extensive neighbourhood. The country roundabout, and especially towards St Bees, is admirably cultivated, and strewed with neat and pleasant houses. In regard to the port, which has a custom house, and a proper appointment of officers, it is now well secured by numerous and costly works, and has every convenience its situation will permit. The number of ships belonging to this port in September 1792 was 477, tons, 56,415. The coal mines at this place are perhaps the most extraordinary of any in the known world. Here are three churches, viz. St James’s, Trinity and Holy church. Likewise Methodist, Quarter and Presbyterian, meetings. James Hogarth Esq. has been a very great benefactor to this town. In 1785 he built a church on Mount Pleasant, which cost sixteen hundred pounds; but as he could not get it consecrated, he opened it for the Methodists. The above gentleman continued building for forty two years, in which time he built two hundred houses, which are still his property: he also built ten square ships, from two hundred and fifty to four hundred tons each. He is the principal subscriber to the Dispensary, and wishes to advance it to an hospital. He also erected a charity school, and endowed it with twenty pounds per annum; he was the first subscriber to the Sunday schools, and still continues one of the principals. He erected and manufactory of work for the poor; he likewise gave a premium for industry. What is remarkable, he always did his business without a clerk. Market days: Tuesday, Thursday, and Saturday; fair day, August 12. It was largely an agricultural parish. The other main sources of employment were limestone quarrying and lime-burning particulalry in the nineteenth century. The medieval church was restored 1818. Threlkeld is an irregularly built village, situated on the Penrith road, 4½ miles E. by N. of Keswick, on the south side of the mountain of Saddleback, commanding a fine view up the vale of Wanthwaite …The chapel, though it is said to be the oldest in the diocese, is in good repair and dedicated to St Mary … A fair for sheep and cattle is held here on the first Thursday in September. The Towngate estate was purchased with several bequests by the overseers and churchwardens, and is now let for £16 10s a year, of which £4 is given to the school, £7 to the poor, and the remainder is expended for the benefit of the chapelry.